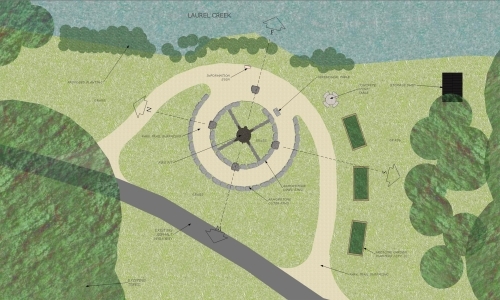 St. Paul’s has developed a design for a ceremonial fire grounds and medicine garden to support the cultural and educational outreach programs of the Waterloo Aboriginal Education Centre. The design by Brian Roth, Architects, was developed in close consultation with Fire Keeper Al MacDonald of Kitchener. The fire pit, which will be shaped as a medicine wheel, will be used for ceremonies and other gatherings. In many Aboriginal cultures, fire honours the spirit of the ancestors. The medicine garden will contain herbs and other plants – such as sage, cedar, sweetgrass, and tobacco – traditionally used for smudging ceremonies and medicinal or blessing purposes. We envision that this space will facilitate community-building throughout the university and surrounding area and to be conducive to peaceful reflection. This space may also be used by the University community for special occasions. For more information, or to support the project, please contact Eugenia Xenos Anderson.